Y’all know I have a sister, Sallie, that is gettin’ on up there in years. She is a big ole girl and gettin’ quite grey on the snout these days. But, that’s not all. She has started havin’ what my Lady calls incontinence in senior dogs. Sallie is pushin’ on her 13th birthday and for a big dog that is gettin’ on up there in years! My Lady also says that incontinence is a common thing among older pups, especially females. To make a long story short, Sallie takes medicine these days to help manage her incontinence and hasn’t had any problems since startin’ on it. It’s a good thing cause she was actin’ mighty embarrassed over it WOOF! Let me get my Lady to tell ya ’bout some causes and solutions for incontinence in senior dogs! Old age incontinence isn’t just a people problem, it affects senior dogs, too! Luckily, there are several different solutions that can help fix or reduce incontinence regardless of the cause. To get a start on fixing this problem for your pet, you should read these tips about dealing with Incontinence in Senior Dogs! While incontinence can affect dogs of any breed or gender, middle-aged or senior females tend to be affected most often. Some breeds also seem predisposed to the issue, including Doberman pinschers, Old English sheepdogs, and cocker spaniels. 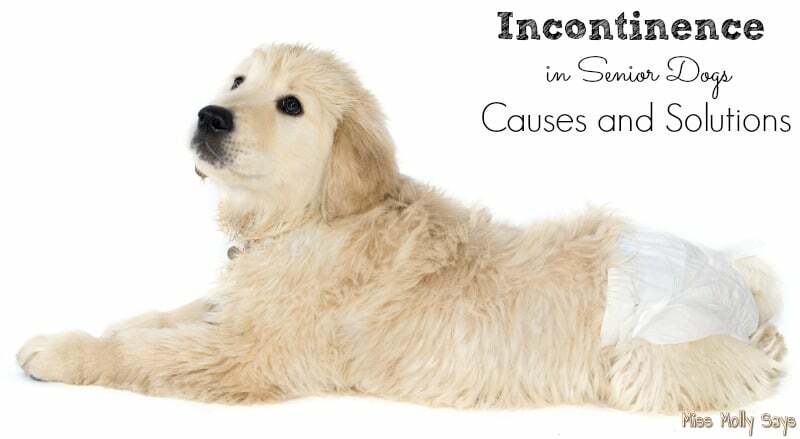 In any dog, their incontinence can be caused by several different issues. Bladder Muscle Weakness– When most dogs are young, their bladder muscles are appropriately strong. These muscles are what work to keep the bladder sealed off until the dog is ready to go. But as a dog ages, these muscles get weakened, usually due to reduced hormone production. As spayed and neutered dogs naturally have fewer hormones in their system, they may show signs of old-age incontinence earlier than intact dogs. Injury or Illness– Illnesses and injuries can also cause incontinence in senior dogs. The problem may be as simple as a spinal injury or bladder stones, or as complex as kidney failure, a protruding disc, or the presence of a tumor. Just as there are several possible causes behind incontinence in senior dogs, there are also several possible solutions! Medication– If the vet determines your dog’s incontinence to be caused by hormonal issues, they may start them on hormonal replacement therapy, usually in the form of an oral medicine. If they believe the issue can be solved without hormones, vets may prescribe the non-hormonal medicine phenylpropanolamine (Proin). This is what Sallie is taking and it is helping her. In both cases, doses of the medication will need to be continued throughout the rest of your dog’s life to maintain effectiveness. 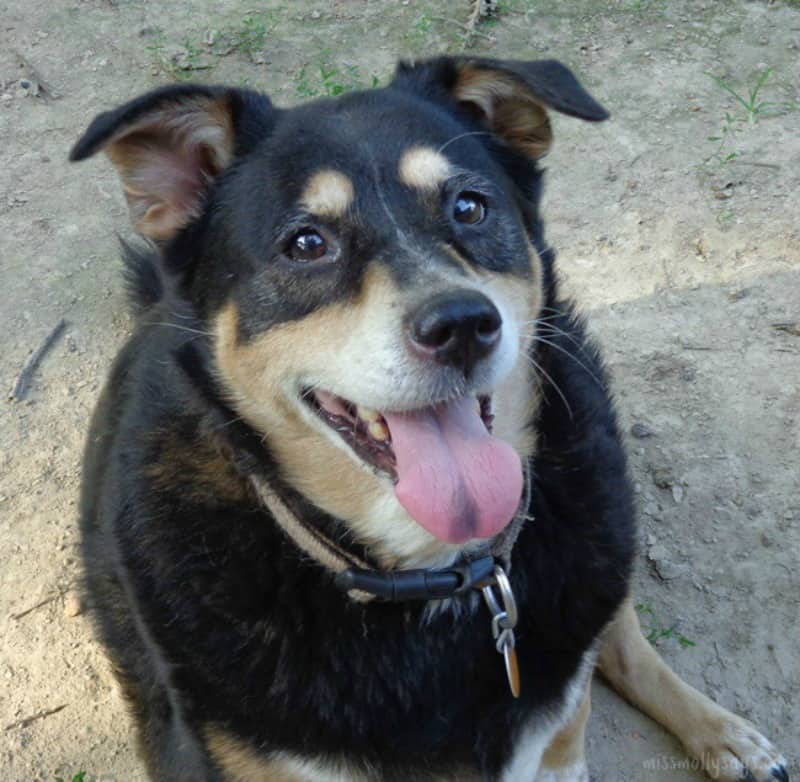 Surgery– Another way to fix incontinence in senior dogs is with surgery. This is usually reserved for cases where there is an obstruction or injury that cannot be cured with medication. In these cases the problem may be completely fixed, or your dog may still have the occasional accident, but not as frequently as before. Diapers– If medication or surgery doesn’t fix your dog’s incontinence completely, you may have to keep them in dog diapers all day every day for the rest of their life. While this isn’t ideal, it is a decent solution. After a little while, your dog probably won’t even remember that they’re wearing a diaper! And you’ll be happy not having to worry about them accidentally going in the house. Pee Pads – Another solution may be using pee pads. Place in their crate if they are leaky during the night and perhaps in an area, they can easily reach rather than waiting to be let out. To figure out the cause and best solution to your senior dog’s incontinence, consult your vet. They can figure out exactly what is causing your pet’s incontinence, and tell you the best way to deal with it! Whatever the bottom line is – know that your senior pet cannot help it. Do not punish or scold your pet! They are not doing it on purpose and it is something out of their control. Be understanding and patient in helping them find a solution or dealing with it. Have you ever dealt with incontinence in a senior dog before? Great informative post, my two aren’t at the age where this is a problem yet but I have a friend with a Doberman that sometimes has a problem so it was interesting to read that that can be common in that breed. We are going through this now with 2 of my 3 dogs. One takes medication that causes increased urine flow and the other has poor control due to his back issues. This is something I have not considered before, nor have I dealt with. Thank you for the information. It’s always good to know ahead of time that this is something that could happen to your dog and how to deal with it. This is good info. Since i have a senior dog, I hope it never comes to needing help on this issue, but you never know. Thank you for sharing. As you guys may know I just lost my darling, darling Señor Mike the Senior Dog. We adopted him at age 15 years! He had continence problems from his medication (a cause that you haven’t listed) and adding another medication on top was just too much. So, he wore a ‘male wrap’ diaper. It was NO BIG DEAL, and he was able to stay with us and have his life for another year and a half. Fortunately, with Mary I have not had to deal with this very often. She has had a couple of late night accidents in the house but I have learned to limit her water after a certain time of night and the problem was solved. We’ll see what happens as she ages, but so far, so good. She’s doing pretty good for a Lab/Shepherd mix at the age of 13 and 14 is right around the corner. Our senior dogs just need a little extra love and care I love my senior! Wonderful and informative post! This can be hard on both the dog and their owners, but something that can happen. My girl is not a senior yet, but she has issues because of being spayed. We have her on Proin, but on and off. When she starts leaking, we put her on it for 1 week, then stop. If she starts leaking again, we go a few more days, but normally, after a week of on, she is good for around 3 weeks with none. My vet said their own dog is the same way. I like that she isn’t on the medication 100% of the time! I had an old dog who had issues with incontinence, poor thing. She was on several meds for other conditions and the incontinence came out of that. She was a dear, sweet dog. I have one wearing diapers right now but she is a pup. She’s being naughty! Great post! Very informative! Love senior dogs so much! How cute do they look in the doggy diapers!? I’m glad there are options out there for dealing with incontinence in senior pets. Yay on 13 years young!!! I think sometimes that can happen also – the taking longer to start peeing – when they get older. I am glad there are options for this problem. I had a Yorkie that lived to 17 and she had occasional accidents, but not very many. We’ve adopted a number of seniors and we agree – diapers, you can even get em so that they look like skirts or shorts and so your senior pet can rock some fashion!! I’m glad I never had to deal with this with my dogs. So happy for Sallie that the medication helps her. I wish I had got diapers for Cookie in her last month. I just did not know as much back then. Thanks for sharing as it will help people deal effectively and kindly with issues. My senior Coonhound girl, Suki, started having issues last year. I worried that it was a sign of her kidneys starting to fail, and after taking her to the vet, we found while she was showing the early signs of kidney issues, what the main culprit was, was actually a UTI, which was cleared up quickly with an antibiotic. She’s done much better since then . although it’s likely only a matter of time at this point. Not dealing with it with my pets, but dealing with it as a senior human. Thanks for the information. i have this problem now sometimes. if i dont catch her at the right moment, she cant hold it very well. she is deaf, almost 15, but she tries to go to the door, she just circles a lot. My last Cocker had elderly incontinence and we used a doggie diaper. She was okay with it and it was even fashionable. Great piece. I haven’t had a senior dog yet but I’m prepared to use belly bands if it comes up. This is such a helpful post, thank you!! I’m not dealing with this issue with my dogs now, but I appreciate all the information for future reference. I haven’t had to deal with this yet, but it’s good information. I have not had this problem in the past but I am glad to know that their are some workable solutions out there.